Kevin Doughty has written a useful and informative book about Telecare and associated ‘Smart Technology’. It will be of interest and relevance to a wide range of stakeholders in health, social care and housing services. Here is the link. The Edison Awards is an annual competition honoring excellence in new product and service development, marketing, human-centered design, and innovation. Award winners represent game changing products and services, as well as excellence and leadership in innovation. Innohome is a nominee with the innovative Stove Guard SGK430. Winners will be presented at the 2017 Edison Awards ceremony in New York, NY on April 20, 2017. The Innohome Stove Guard is becoming the solution of choice to prevent cooker hob fires. Universities are increasingly installing the Stove Guard to protect students in their kitchens within student accommodation blocks against cooker hob fires especially around unattended cooking. Housing Associations are also recognising the importance of using this type of technology to safeguard their vulnerable tenants. Innohome has been awarded as a 2016 CES Innovation Awards Honoree in the Accessible Technology category for it’s innovative Stove Guard cooker safety system. This event was held in Las Vegas, Nevada earlier this year. The CES Innovation Awards are an annual competition honouring outstanding design and engineering in consumer technology and considered to be the highest accreditation in the USA in this sector. Innohome Stove Guard SGK510 is the only product currently approved by all of the following authorities: The Norwegian Insurance Approval Board, The Association of Stove Guard Standard in Sweden and by The Federation of Finnish Financial Services. 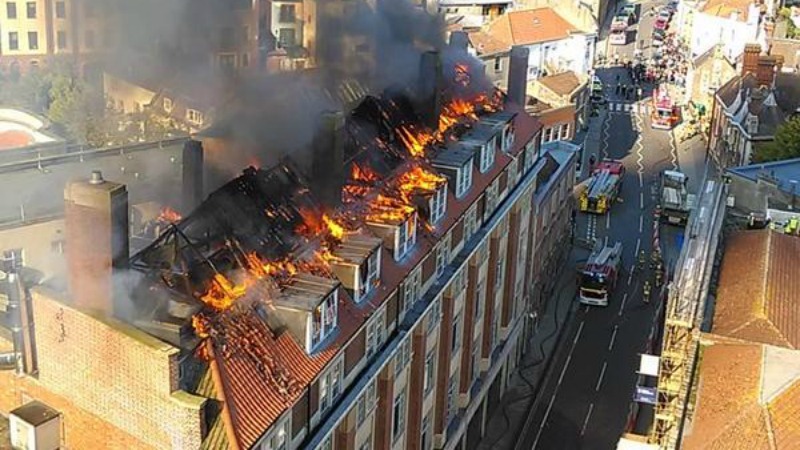 Large fire with extensive damage in student accommodation started from an oil filled pan on the cooker hob in student kitchen at Bristol University, see link to Bristol 24/7 in Blogroll. Just been announced that Innohome have been selected as a finalist for the IFSEC 2015 Award in the Active Fire Category. Winner to be announced on November 24th at the Gala Awards Ceremony to be held at the London Hilton. This make it the second year running that Innohome have been nominated as a finalist in the Fire Sector awards, last year Innohome were the winners in the Fire Sector for their SGK510 Stove Guard hob fire prevention device. As winners of the FIREX 2014 Innovation of the Year Award for the Stove Guard SGK500 gas cooker safety system, Innohome have this year entered for the 2015 Innovation of The Year with their new Innohome GGK100 Gas cooker safety system. Innohome won the IFSEC award in 2014 and have applied for the 2015 award in both the Active and Passive categories for their new Innohome GGK100 Gas Safety System. Finalists for both awards will be announced in September. Innohome Stand at FIREX Expo at the Excel Centre in London was a tremendous success with a large number of serious enquiries leading to appointments to present and demonstrate the Stove Guard to a wide range of potential corporate customers including Housing, Universities, Fire & Rescue Services, Social Care and Sheltered Housing. We even had a 4 minute TV slot at Firex which attracted a great deal of interest. 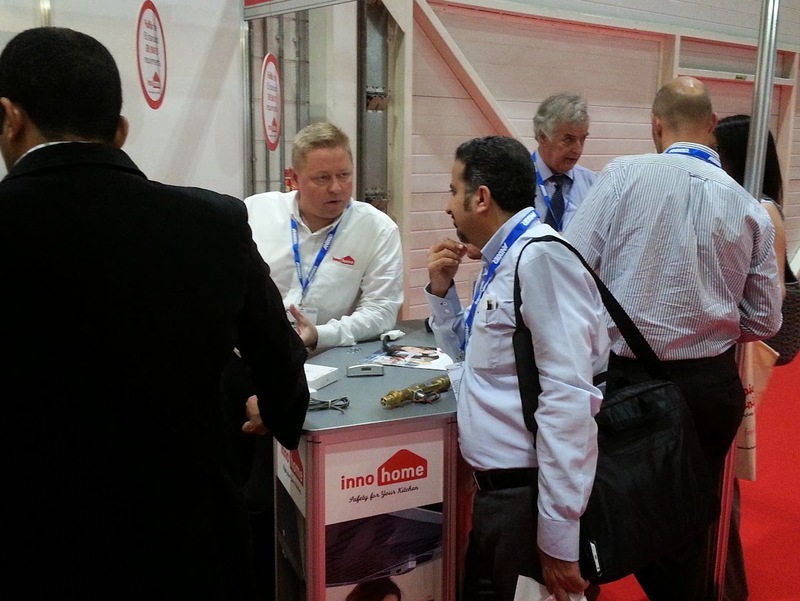 Innohome will be exhibiting at the forthcoming FIREX International 2015 exhibition at the Excel Centre in London. 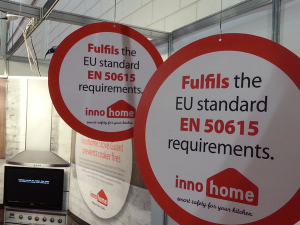 The dates are 16th – 18th June 2015 and the Innohome Stand is E90. Innohome Stove Guard are among the five Exciting Fire Innovations at FIREX International 2015. The Innohome Stove Guard will be showcased on the Innovation Trail at FIREX International 2015. FIREX International is the world’s definitive fire prevention and protection event where 15,000 fire safety professionals gather. We look forward to welcoming you to our stand E90 and to see and discuss the innovative and award winning Stove Guard. 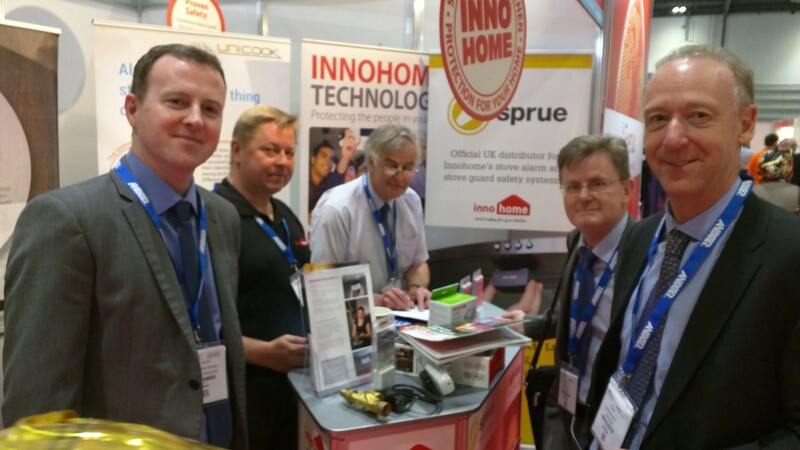 Innohome have just appointed Sprue Safety Products Ltd of Coventry as their UK Importer/Distributor for the Innohome range of Kitchen Safety Products including the highly regarded SGK510 Stove Guard – winner of two National 2014 “Innovation of the Year awards” within the Fire Sector. Sprue design, manufacture and supply products that save lives. Well respected within the Fire sector with excellent facilities and high service standards to their customers. This month WHICH consumer magazine has produced an article on ‘ How to stay safe in your home’ using simple low cost technology. They tested a number of products including the Innohome stand alone Stove Alarm SA101. Brighton University celebrates installation of Innohome Stove Guard to provide protection against cooker top fires for their students in the universities accommodation kitchens. 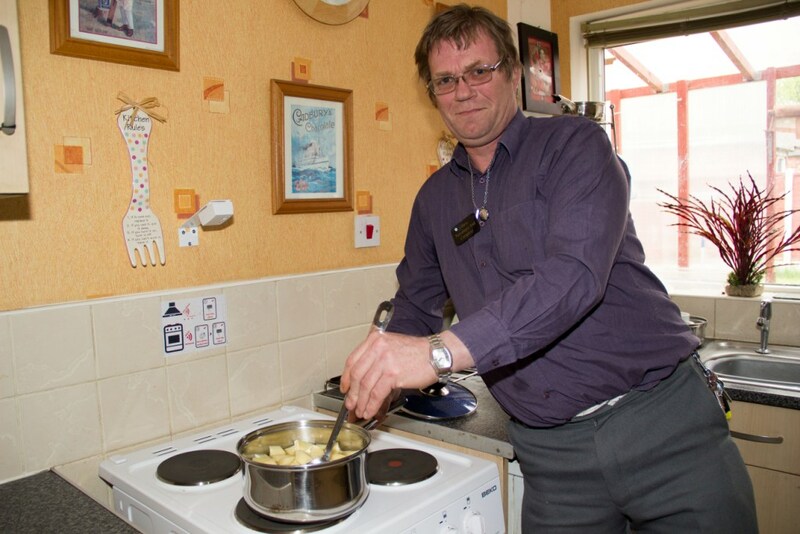 Leonard Cheshire in Northern Ireland have just had installed the Innohome Stove Guard system for some of their tenants as part of a trial to provide greater safety and independence around cooker safety. Installation carried out by one of Innohome`s appointed specialist distributors working closely with universities. 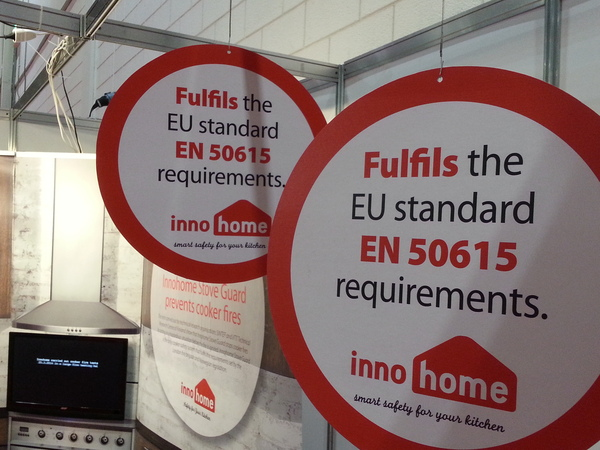 Good news, the new European Standard EN 50615:2015 – Household and similar electrical appliances – safety – Particular requirements for devices for fire prevention and suppression for electric hobs (cooker tops) – has been ratified by CENELEC on Jan 5th 2015. The Innohome Stove Guard System meets and exceeds the requirements of this directive and standard. We have done it again !!!!!!! 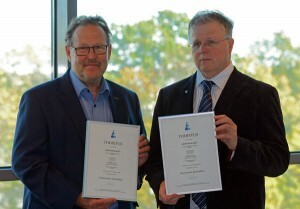 INNOHOME have won their second award within a month of their first. Against international competition, Innohome received the IFSEC`s 2014 Active Fire Product Innovation of the Year Award at the Gala ceremony held at the London Hilton for their Stove Guard SGK500. This is praise indeed and recognises the innovative approach to cooker safety within the home kitchen that Innohome are taking. Innohome have been nominated yet again as a finalist for an innovation award. This time it is the IFSEC`s Security and Fire Excellence Awards 2014 – Active Fire Product Innovation of the Year, which is being held at the London Hilton on 27th November. Fingers crossed, we are certainly looking forward to this event which reinforces the gaining recognition of the Innohome Stove Guard cooker safety system to supporting kitchen safety. We have done it !!!!!! INNOHOME HAVE WON the innaugral 2014 FIRE Magazine Excellence in Emergency award – sector “Innovation of the Year” for their Stove Guard System. The ceremony was held at the prestigious Caledonian Club in Belgravia London and Matti and Pertti from Innohome and myself were so proud to be there to receive this award. It recognises their contribution to kitchen fire safety and is a credit to all those team members at Innohome back in Finland. Awards were also given to other outstanding contributions within the Fire Service and Fire Sector community together with a Lifetime achievement award for outstanding long term service to Fire and Emergency. 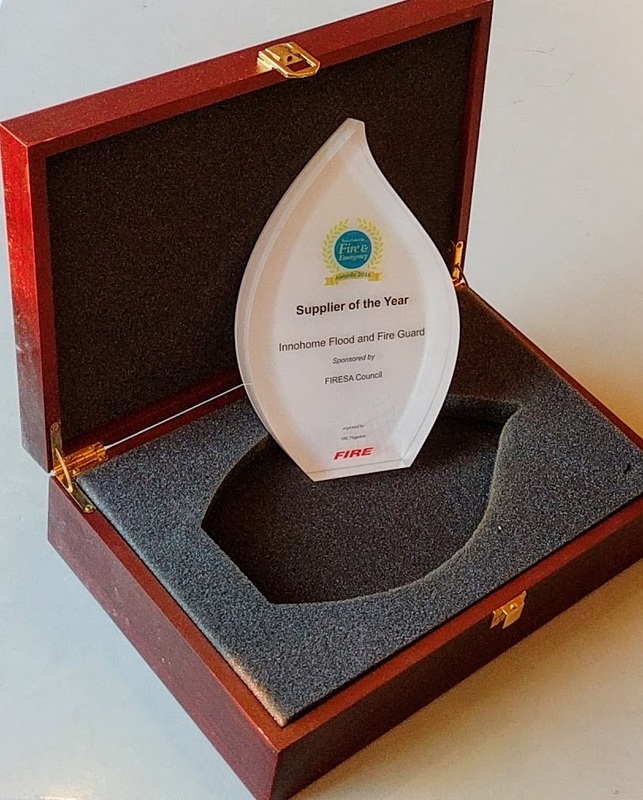 This Innovation of the Year award recognises the contribution that the Innohome Stove Guard system can make towards cooker hob safety in the kitchen – the most dangerous room within the home. It is a combination of some 8 years or so developing the Stove Guard working with many fire services and other organisations across Europe by dedicated and passionate individuals working together within a small team. Innohome OY has now reached a milestone and have delivered over 100,000 Stove Guard systems supporting cooker safety in homes. 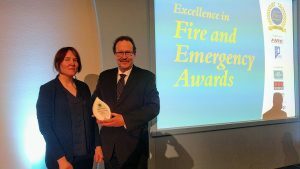 Coming up later this month is the award announcement for Excellence in Fire and Emergency Awards – “Innovation of the Year” sector, being held by FIRE Magazine – fingers crossed! 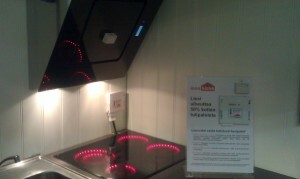 Lots of interest both from UK and elsewhere in our innovative solution to preventing cooker hob fires in the kitchen. Looking for a suitable distributor to market and supply our products into the Social Care Sector in UK. Innohome awarded Innovation Hot Spot at FIREX. A lot of serious enquiries from potential distributors both within the UK, Europe and beyond. A busy month, we are showing the Innohome Cooker Hob safety system for the first time at the FIREX Exhibition being held at the Excel Exhibition Centre in London from June 17th to June to June 19th. Firex is aimed at professionals and organisations concerned with fire safety and this unique technology will be of interest to those who want to prevent cooker hob fires rather than reacting after the fire has started, potentially saving injury and costly damage. 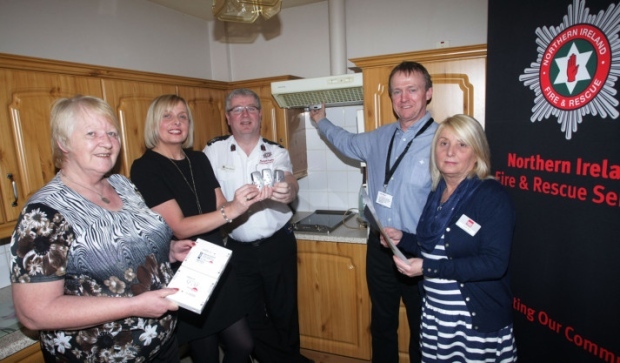 A good opportunity for organisations to look and discuss how our products can improve cooker hob safety in kitchens within accommodation blocks as well as supporting vulnerable groups to remain independent within their own home. Just finished exhibiting at a successful Universities Health and Safety for Fire seminar conference (USHA). Lots of interest in preventing fires in student accommodation kitchens. Delegates were able to see our range of products to help prevent cooker top related fires in student kitchens. This was a result of a pan fire at around 8.40pm in the evening. A security person was taken to hospital to be treated for the effects of smoke inhalation. We have trials of the Innohome Stove Guard running in two universities at the moment. Just had confirmation that one university has now confirmed an order for a number of the GSK300 Stove Guard systems to be fitted in student kitchens to assist in protecting their students in university accommodation from cooker top related fires. The Stove Guard is a preventative approach to cooker hob fires, alerting and if necessary switching off the cooker supply before their is a potential fire. 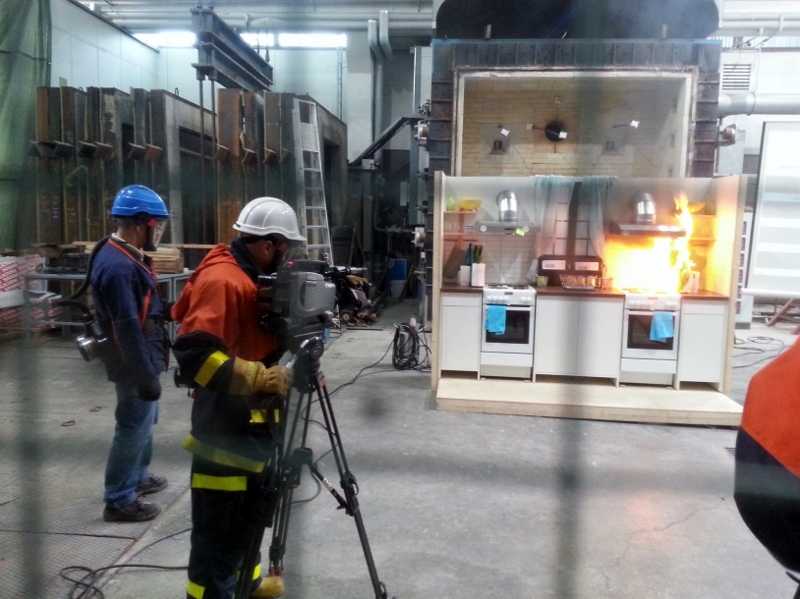 Innohome made cooker fire tests 24th March in a large fire hall of VTT Expert Services Ltd in Espoo, Finland. The tests and the results were reported impressively in the Finnish TV. Here is a video from Finland this month of a live test of a cooker fitted with the Innohome Stove Guard SGK500 comapared with a cooker not fitted with the Stove Guard. The left hand cooker is fitted with the Stove Guard and you can see it successfully turned the cooker off before ignition (watch for the small magnified area showing the cooker light) whilst the right hand continued to work and ignited the oil in the pan with dramatic results. Live comparison test of Stove Guard GSK500, left hand cooker is fitted with Stove Guard and successfully turns cooker off whilst right hand cooker goes on to catch fire. March 24th 2014. Innohome are attending Firex International to be held at the Excel Centre in London 17th to 19th June 2014 and we shall be displaying the Innohome range of cooker fire safety products to help prevent cooker hob fires, the second serious cause of fires within the home after smoking. Cooking is an important daily living activity to support independence at home, the Stove Alarm and Stove Guard can both help to prevent such fires happening. 2014 looks like being a busy year, we will be attending a number of exhibitions and seminars to display the Innohome range of kitchen related products. We shall be attending and exhibiting at the Universities Safety and Health Association (USHA) Fire Confererence on 3rd and 4th June at Portsmouth University. We have supplied several universities with Stove Guard systems for trial in student kitchens to address cooking related fires. Details of the new SGK 500 Stove Guard can be found on the Data sheet below. The SGK500 also features automatic self-test every time the cooker is switched on to ensure the system is working OK. In addition the Stove Guard detects if the Intelligent Sensor has been removed from its mounitng and will not allow the cooker to turn on, this safety feature prevents tampering of the system. Launch of the new Innohome SGK 500 Stove Guard offering even further features over the existing 300 model which will still continue in production. 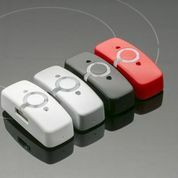 The new Intelligent Sensor part of the SGK 500 has been attractively designed to fit in with modern kitchen design and comes in a choice of 4 colours – glossy white, silver, red and black. Very low energy use and long working life. The Intelligent Sensor which warns of a potential fire situation is now powered by a small Solar Panel – there is no need for external power or changing the batteries. The SGK500 system is self-testing each time the cooker is turned on. The Intelligent Senesor incorporates a dislocation alarm for additional safety so that if it is removed it prevents the cooker from being used. We have just confirmed that we have taken a Stand at the first Trade Days Show at the NEC Birmingham 5th & 6th October 2014. We shall be exhibiting our Stove Guard Cooker safety system along with other related products to support independence within the home. This new Trade Days Expo. is aimed at manufacturers, suppliers and retailers of a wide range of Assistive Technology and mobility products to support independent living. It allows opportunities to network and to do business between potential trade partners and will help get products to a wider market for the benefit of the end consumer. 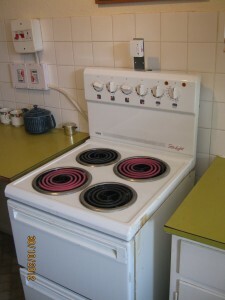 We have a University trialing a couple of the Stove Guard systems in students kitchens to overcome problems they have with students cooking activities and forgetting they have left a cooker on with a pan on the ring, resulting in potentially expensive damage and the inconvenience of a kitchen being put out of action. Housing trial still continuing, hope to have results soon. A number of larger repeat orders for the Stove Guard System demonstrating how popular this device is to support independence. The stand alone Stove Alarm SA101 is proving popular to support vulnerable people within the community. Next month we hope to receive some results from tenants who were part of a longer term trial within a Housing Association scheme to see how the Stove Guard fitted in with their day to day lifestyle and how they felt it supported them. Just heard good news that our Stove Guard system is helping a gentleman with Narcolepsy (condition of unexpectedly falling asleep) to safely manage his cooking. This is part of an initiative by Humberside Fire and Rescue and North Linconshire Homes to support vulnerable people in their community. Since being fitted in April it has sounded an alert twice and shut down the cooker preventing a fire. The gentleman had been identified at risk after several call outs by the local fire service, when the gentleman fell asleep the hob had overheated, pans had caught fire and sounded the smoke alarm putting the gentleman at risk and the Fire Service attended. Stove Guard system helps gentleman with Narcolepsy manage safe cooking . Stove Guard i300 now has even better features – the latest version of Stove Guard i300 now comes with auto system self-test each time cooker is used together with additional features to make installation even easier. The Innohome Stove Alarm and Stove Guard featured in the top 10 products at Naidex this year. 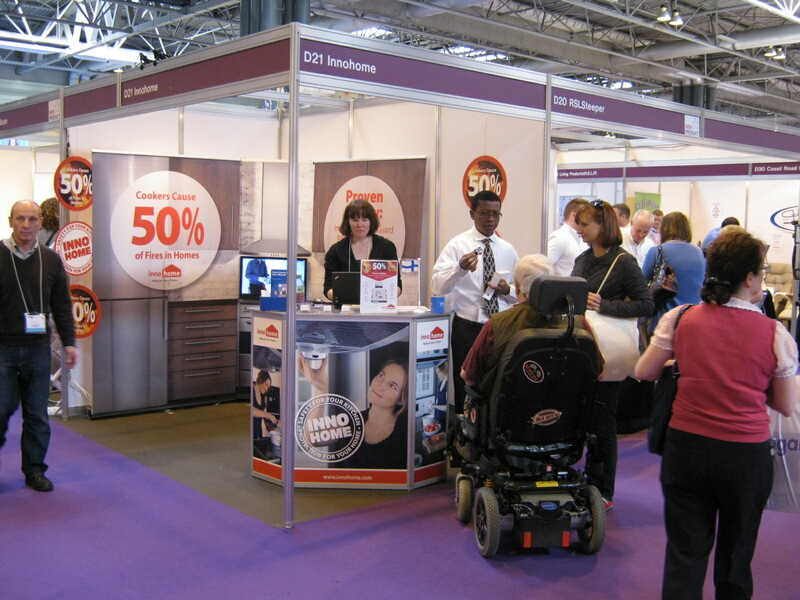 Naidex show is especially good this year, there are some interesting new innovative technology products on display together with a comprehensive range of Assistive Technology to address most users needs. The Seminars offer the usual good CPD opportunities to upskill and learn new approaches to delivering services. We are ourselves exhibiting our products for the first time at Naidex and we have received considerable interest from a wide range of potential sector users. Later when I get back I will upload a pic of our stand. Demonstration trial at Eastbourne went very well and showed how the Cooker Safety System was able to turn the cooker off well before the oil filled saucepan caught fire. All were impressed and we even had a representative from Strathclyde Fire Service present. We now have our stand number for Naidex National – D21, you are welcome to visit us on the stand where we will have a display of the Cooker Safety System. Interest has been high in the innovative Cooker Safety System. We have supplied a number of organisations with these kits together with the stand alone Stove Alarm. Towards the end of the month we shall be holding another joint demonstration trial of the Cooker Safety System, in attendance will be East Sussex Fire Service, Eastbourne Housing who are providing the kitchen location, Kent Fire Service, London Fire Brigade, Innohome and myself. Innohome will be taking a stand at Naidex National Exhibiton at the NEC in Birmingham in April. The full system will be on display and you will be able to discuss the benefits and operation of the Cooker Top Fire Safety System with us. The Cooker Safety System will able to be seen on the London Fire Brigade Stand at ‘The Healthcare Innovation Expo’ being held at the Excel centre in London in March. The live demonstration of the Cooker Safety System went very well. The community fire safety officer had arranged the test because of their interest in reducing cooking related fires and he was impressed with how the system detected the potentially dangerous rise in temperature on the cooker top and turned the cooker supply off well before the pan would actually catch fire. Also in attendance was the Health and Safety Manager for the Social Landlord who provided us with the use of the kitchen within one of their flats. 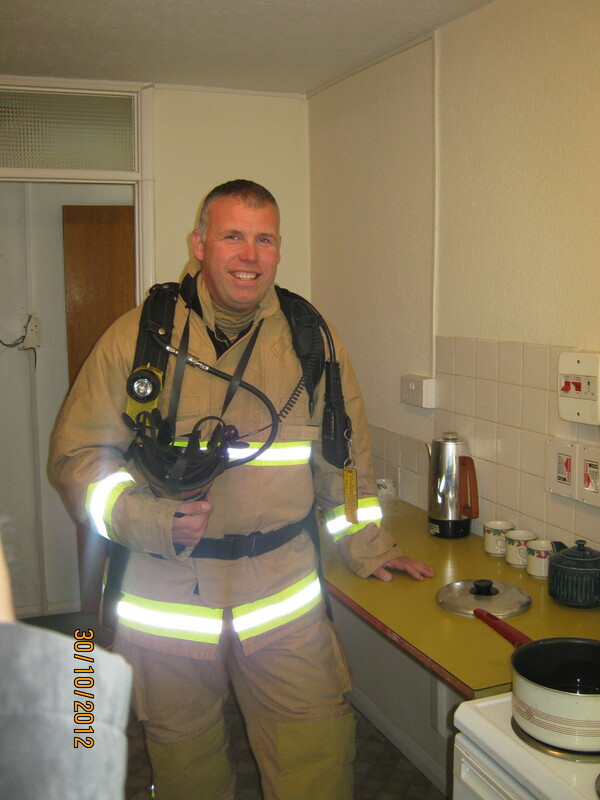 They are also very interested as they have experienced a number of cooking related fires in their tenant’s kitchens which has caused expensive damage as well as the need to re-locate the tenant. The pics show the cooker top with rings left on which were detected by the Stove Alarm after 3 minutes and switched the cooker off. The pics also show the oiled filled pan starting to smoke before it ignited and you can see the smoke and fumes starting to increase. The fumes became very dangerous as they increased further and it is no wonder that people are overcome by them. We left before ignition as the fumes were bad and allowed the firemen in attendance to standby and put out the fire. We had a CO2 detector in the kitchen and the audible signal from this activated the Stove Guard cut off switch before ignition. This we feel is a very useful addition as it detects harmful environment conditions before an actual fire. We shall be supplying a Cooker Safety Kit for installation in one of the social landlord’s tenant kitchen, to get real user feedback for evaluation. Cooker Safety System Installed. Cooker showing rings on with detail of the temporary Stove Alarm fitted to cooker back and the Stove Guard cut off switch wired in close to the cooker supply switch for demonstration purposes, normally it would be behind the cooker. The cooker supply cut off 3 minutes after putting the rings on. 30th – We have an important practical demonstration lined up in conjunction with a Fire Rescue Service and a large Housing Association who have experienced fires within tenants kitchens. 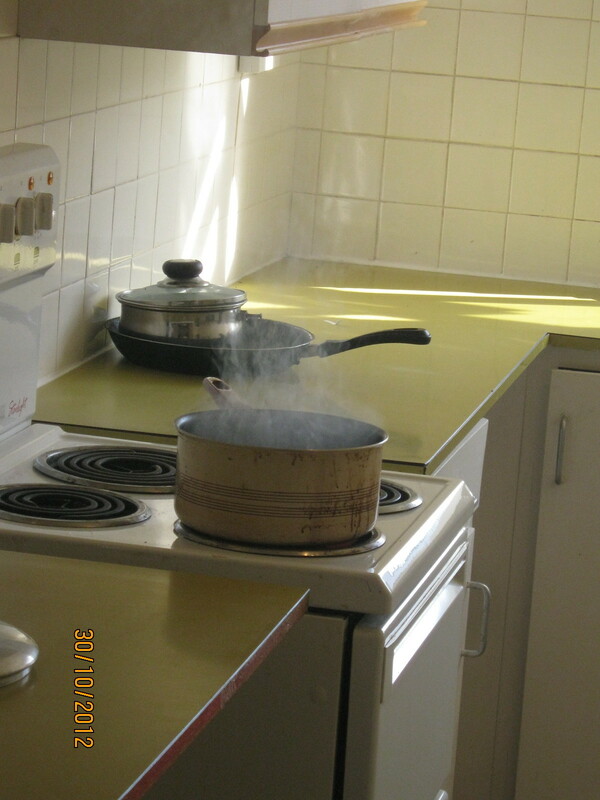 Domestic kitchen fires are the second highest cause of domestic fires after smoking. This is to be a live test comparison between having the cooker safety system fitted and without it, it will include letting the pan catch fire(hopefully not when the system is fitted of course!). There will of course be a fire crew standing by – should be exciting. Will post more information after the trial. 9th June 2012 – London Fire Brigade – Euro 2012 – FIRE CHIEF TELLS EURO 2012 fans to eat away from home – cooking safety advice and alcohol.